I thought that Ireland acquitted herself quite well with the recent IFTA ceremony (Irish Film and Television Awards). The show was a tad long but the new venue of the Conference Centre was much more suitable for an Awards Show with its theatre style seating. However, particularly as the show went on (and it did go on…. for ages in fact), each time the camera panned over the audience there seemed to be rather a lot of empty seats. “Not great for TV guys”! Where were the seat fillers? Ya wha Gay? Seat fillers? Where were the seat fillers? You see I am an expert on this subject because a few years ago I was lucky enough to be in Hollywood on holidays and had a fascinating tour of the Kodak Theatre, home since 2001 to the annual daddy of all awards ceremonies, The Academy Awards. It was here that I learned about seat fillers. Americans know how to do events properly. They know that when a high profile event is going to be carried on live TV, a lot of empty seats does not lend the occasion a sense of prestige. Hence the need for seat fillers. And as it’s not just the Academy Awards that uses seat fillers, all major televised award ceremonies do. A seat filler is a volunteer who will quickly slot into a seat vacated for any reason during the ceremony. So when Tom Cruise heads off for a pee, a designated seat filler is immediately dispatched to keep his seat warm as it were. This is a serious business. There are strict rules to being seat filler. You have to look the part – so the ideal (read successful) seat filler is usually young (under 35), good looking and ‘svelte’. They must turn up to the event, looking every bit as glamorous as the invited guests. They must then be content to wait in a corridor or back room until required. When they are required to fill a seat, they must do so quickly and quietly. Under no circumstances should they speak to ‘the talent’ (the movie stars etc) unless they are spoken to first. They must not make eye contact with ‘the talent’. Of course it goes without saying they are not permitted to have a camera or to ask for autographs. And as soon as the star arrives back from the loo or fag break, they must steal away quietly back to whence they came. So, yes you have guessed it, there are agencies who ‘recruit’ suitable seat fillers. I have no doubt there books are full of wannabe actors and screenwriters, the pinnacle of whose careers may well be to sit for a few minutes in a seat which still carries the body heat of their idol! So IFTA, there is no excuse – get your seat fillers in line for next year! 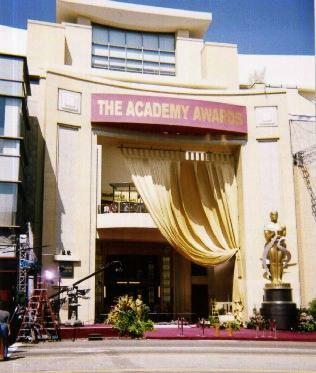 The Annual Academy Awards take place in Hollywood on this Sunday night and will be screened on Network 2 on Monday at 9pm! There won’t be an empty seat in the house! I had heard about these fillers before and am sad to know that I am too old, fat and ugly to be one. Maybe we're not so fussy in Scotland…? I hope it's a well paid job – dressing for the Oscars can't be cheap! That is mad, Barbara, it's amazing what people would do to get close to the celebs!! Congrats on your radio slot, that is terrific news. Are you up for the job? Enjoy your Oscar night. Wouldn't it be great if one of those seat fillers in a fit of madness, leapt to his or her feet and shouted an obscenity, – not a really bad one – just a bit rude. Of course that would be the end of any aspirations of a show biz career. I though the IFTA awards went well but the audience were soooooo lacking in a sense of humour. Hi Barbara, I left an award for you over at Inkpots n' Quills. Enjoy the Oscars! Ah I love it when I learn something new everyday. I must confess I didn't know about seat-fillers … have an event coming up for International Women's Day …may need to organise some stand-by seat fillers if ticket sales don't pick up! Thanks all for the comments… looking forward to watching the Oscars tomorrow night! Welcome to My Kitchen Table Mary and thanks for the comment…. I agree with Mary above me… we need to learn new things everyday (we didn't know about seat-fillers either…), and this blog has been doing an important contribution regarding it 'cos all its posts are useful. We're so proud about it. Thanks for share it with us. I would like to watch Irish Film festival something different more fair. There are many great independent movies.